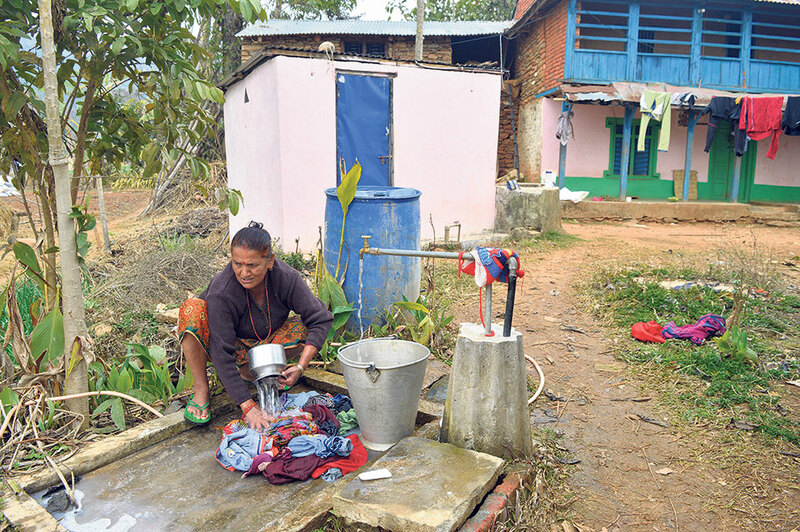 A Local woman washing clothes in the water tap constructed by Beltar Drinking Water Project. TANAHUN, Feb 18: Until three years ago, locals of Bhanu Municipality-8, Beltar had to struggle a lot for drinking water. They were compelled to walk a long distance to fetch water for daily use. However, things have changed for good now. All villagers have drinking water taps in front of their houses. Nowadays, locals can indulge in washing, cleaning, bathing and irrigation without thinking twice. After repeated complaints from villagers, the Drinking Water and Sanitation Division Office (DWSDO), Tanahun, initiated a drinking water project in 2015. This has now offered a huge respite to the villagers, according to Shambhu Paudel, chairperson of Beltar Drinking Water Consumers Committee. "There was a time when people had to walk miles to manage a jar of water. As locals kept requesting for the drinking water at their doorstep, the DWSDO sanctioned budget and locals also collected donation for the project," said Paudel. Durga Khatri, a local, stated that the project has offered a huge relief to them. "These days, we have enough time for other works as we no longer have to fetch water from ear-away sources," said Khatri. The DWSDO spent Rs 1.2 million while the locals contributed around 20% for the project. "We have also built a treatment plant to make sure that the people receive clean drinking water," said Chairperson Paudel. Especially the women have been benefited by the project, as they were the ones who had to fetch water. There are altogether 44 households in Beltar and all of them have drinking water taps in their houses. Easy access to water has also helped vegetable farming prosper in the village.